Deck mounted hoops most commonly come in the shape of a basketball hoop for pool sleeves or are bolted onto the pool deck. 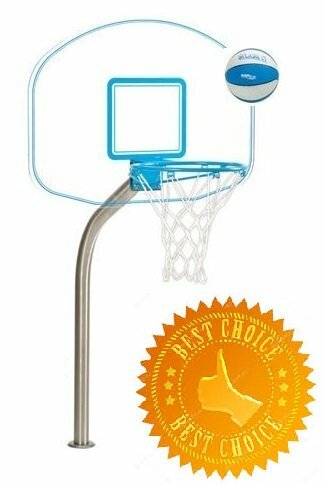 They are the pricier option and range from $500 for a junior sized hoop to $4000 for a heavy duty, professional regulation sized pool basketball hoop for adults that is also adjustable in height and can withstand serious play and horsing around. 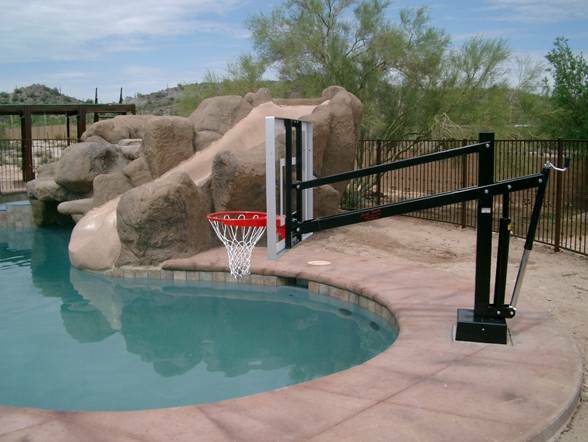 If you love playing basketball in the pool and you know things can get carried away a little you’ll need a tough unit to stand up to it. S.R. 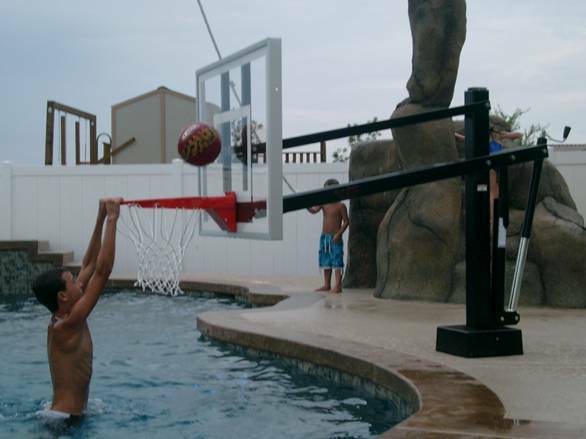 Smith supplies several basketball hoops specifically designed to last well in harsh, corrosive environments like coastal climates and salt water pools. The two stainless steel legs are not just made of stainless steel but also sealed and coated with vinyl for extra protection. 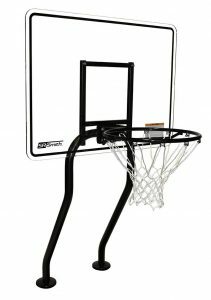 The competition grade acrylic board with regulation rim easily copes when the game gets serious and competitive. The Swim N Dunk in action. 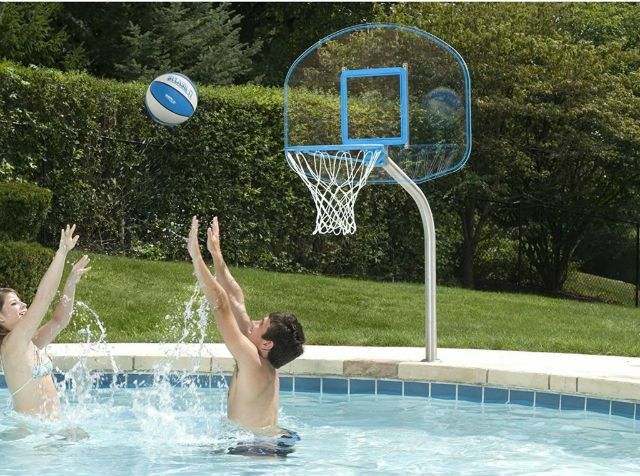 Dunn Rite manufactures a range of basketball and volleyball sets for the swimming pool. The minimalist design of the Clear Hoop adds value to any pool. Thanks to the use of stainless steel it is well suited for the harsh pool environment including salt water pools. The post requires a 2 3/8″ hole or pool sleeve of that diameter. Once the post is inserted the set up is complete and creates a wonderfully uncluttered pool environment. The clear ⅕ inch thick clear backboard and curved stainless steel post look very stylish and will do so for years to come. There are two rim size options available. The Hydroshot from First Team is tough. The post is a 4″ (!) square stainless steel leg. Next comes the dual strut arm to adjust height from as low as 30″ above water to a whopping 84″. Height is adjusted by using a crank handle at the back. First Team provides hoops like this to commercial places like water parks. 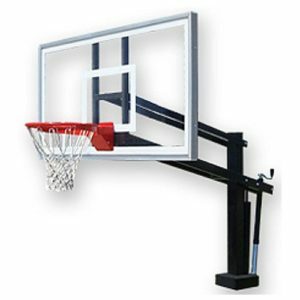 So you can rest assured that everything is truly competition grade: the acrylic 36″ x 60″ backboard, the rim and unit. 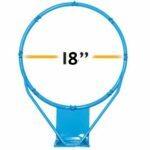 There is no way around it, this kind of superior quality pool basketball hoop suitable for adults comes with a serious price tag. This is a demonstration of the Heavy Duty Flex Goal from First Team, Inc. Underneath the cover plate, there are 2 springs that provide the responsive return action for the breakaway function. As the players hang on the rim, the springs compress, and the rim returns to its original position when it’s released. The rim on the FT186 is built with extremely strong.1875-inch steel construction. It’s supported over 60 percent of the ring with a welded-on ring support. The entire ring is powder coated in orange for exterior durability.